The SOUL FAST WORKBOOK, is a 40-day personal journey into the care and wellbeing of your soul. 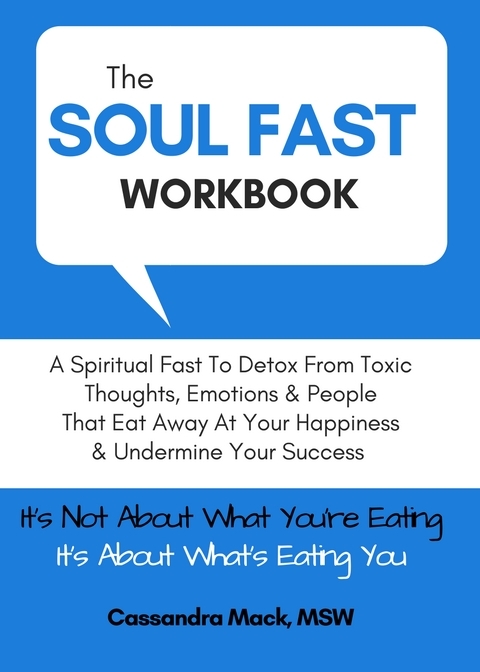 In this workbook, you will be equipped with powerful tools and information that will empower you to renew your mind, replenish your spirit and detox from all of the negativity and toxic rubble that seeks to eat away at your peace, undermine your success and dismantle your sense of wholeness. Grounded in timeless Biblical principles, The SOUL FAST WORKBOOK is divided into 4 sections: your thought life, your emotional life, your choices and your relationships. Section 1 of The Soul Fast Workbook, focuses on The Mind. It encompasses day 1 through 10, where you’ll be fasting from toxic mindsets and counterproductive self-talk. Section 2 focuses on The Heart. It encompasses days 11 through 20, where you’ll be detoxing from emotions that bring down your mood and intensify fear-based feelings like: inadequacy, self-loathing, rejection, dejection, and envy. Section 3 deals with The Will. It includes day 21 through 30 where you’ll be assessing your choices so that you can figure out how to stop making decisions that work against your own wellbeing and success. Section 4 focuses on your Relationships. It encompasses day 31 through 40 where you’ll be evaluating your relationships so that you clearly determine which relationships are producing good fruit in your life and which ones are draining you and pulling you away from purpose.